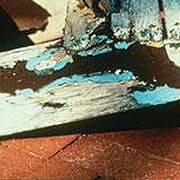 Loss of adhesion when a water-based topcoat is applied over many old coats of oil-based paint. Remove all loose paint down to the bare surface. If you’re using liquid removers, be sure to wear long sleeves and gloves to protect your arms and hands from splashes. Prime any bare surface with a high-quality primer and allow it to dry thoroughly. Paint with a high-quality paint in the desired finish.